Yeah, yeah, so the pic below doesn’t look like much. Sorry, alright? ‘Twas lifted from a patent recently scored by Apple. According to available sources, it’s a clever upgrade of iOS device/laptop peripherals for the sake of improving security. In short, you can use a charger to recall a password thanks to a memory chip installed in the, uh, charger. Sounds simple, but it might hint at future possibilities with Apple products. Apple has patented a power charger that also serves as a password backup, one that’s in some ways more convenient and secure than the typical security questions used to recover lost passwords. 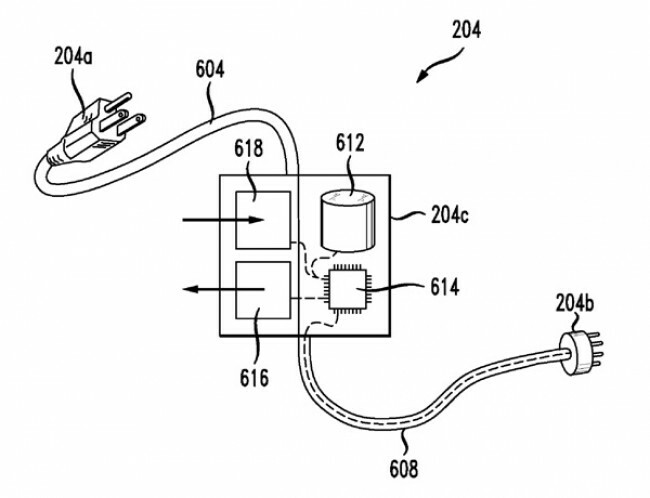 According to the patent a forgetful user could simply plug in the cord, and it would provide a unique ID number stored in a memory chip in the adapter that acts as an decryption key, unscrambling a backup copy of the password stored on the machine. This inventive approach to password security is being construed as a serious effort to preserve user information in the event that their iOS device or laptop is lost or stolen. Though by trying to figure out what exactly Apple are hoping to accomplish with a memory-implanted charger, a few tech journos noted it’ll all be for naught if the charger itself goes missing.